What happens to your Facebook account after you die? 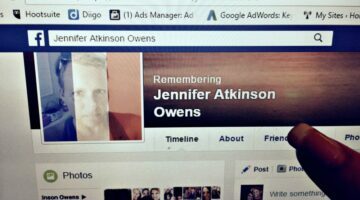 Will someone set up a Facebook memorial page for you? It might not be at the top of your list of concerns right now, but you should know what happens to your Facebook after death. Here’s everything you need to know about online memorials for loved ones and how to plan for your own before you die. I get so frustrated when my PC is sluggish — how about you? I didn’t even realize the free WIndows Disk Cleanup tool came with my laptop! I get really concerned when I run a disk cleaner because I don’t want to lose files. This Windows system cleaner is really good, and doesn’t touch your personal files and photos. Here’s what you can expect if you use a disk cleaner for your PC, and what to do if you have a Mac. My email has been hacked — Now what? Follow these simple tips if you’re wondering what to do if your email has been hacked. Act quickly to protect your other devices and security from an email hacker. Wearable Technology Trends: Should You Buy The Best Wearable Tech Or Not? Have you seen all of the wearable technology devices out there lately? There are headbands, watches, patches, and more — all vying to be one of the best wearable tech trends. I’ll explain which wearables are worth buying, those that you shouldn’t waste your time on, and what the future of IoT looks like. ‘What are the best times to post on social media?’ is the #1 question small business owners ask about their online marketing. Knowing the platform, target audience, and expected results help determine the post time that is best for each social media platform. I have some great information for you about social media scheduling and hope it helps you! Have you ever been working on your computer and accidentally deleted something? I have and it’s a terrible feeling! Stress no more — here are simple ways to undelete. How To Find Your Lost Cell Phone With Free Programs Online: Find Your Phone Fast! Can’t find your phone? Here are the best websites and apps that will help you find your lost cell phone fast! Worried About Social Media Hackers At Home Or Work? Clever Social Media Tips To Keep Your Personal Information Private! Social media hackers are a sly and cunning breed. Use password managers, two-factor authentication and more tips to keep your social media sites safe. Help… Speed Up My Computer! How Do I Speed Up Windows 10 & Make My Slow Computer Fast Again? New laptop? Charge it to 100% and then drain it all the way to maximize the battery life. This and 4 other great tech tips for setting up your new laptop. How much screen time is too much? To ensure Internet safety for kids, you need to know the risks, limit their accessibility & monitor their activity online.